Service Provider T.38 Offload - Distinguish Yourself from the Pack! Do your sales reps wince every time they have to have an awkward conversation with a prospect about how to handle their fax machines and fax servers? Can they really tell those same customers to ‘keep a POTS line’ for faxing with a straight face? Do you really want those customers to be billed for anything by a competitor? In a crowded, competitive market why not distinguish yourself from the pack by doing the unthinkable and officially supporting fax? 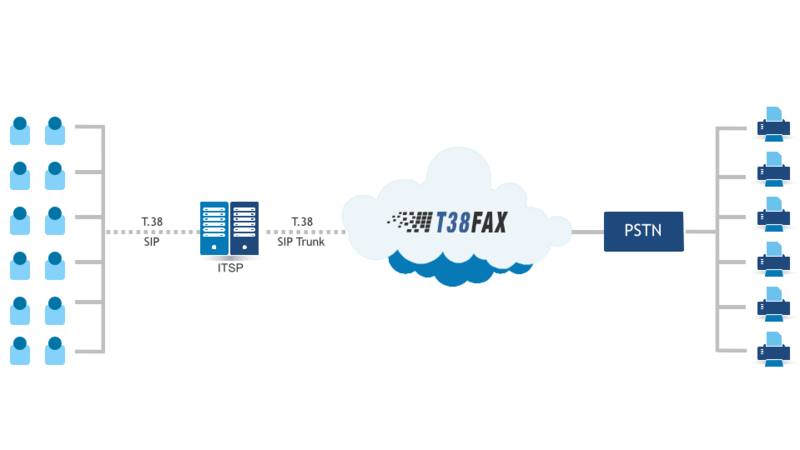 Now you can outsource the headache of supporting fax on your network and take advantage of our ‘service provider T.38 offload.’ Implementation is trivial – simply establish a SIP trunk to T38Fax, route your outgoing fax traffic via that trunk, port your FAX DIDs and toll-free numbers to us and we take care of the rest. We are pleased to offer wholesale pricing to service providers who can meet certain volume commitments – ask a sales rep about our service provider T.38 offload plans today. All fax calls start out as G.711 audio, but when T.38 is enabled and fax tones are detected on a call, a SIP re-INVITE is issued requesting the session switch to T.38 UDPTL instead of RTP. The T.38 uDPTL payload isn’t audio, it’s data. It’s a symbolic representation of fax tones in exactly the same way RFC2833 (check this) is a symbolic representation of DTMF (touch) tones, and it performs reliably over crappy network links for the same reason. Now, the T.38 conversion happens at the interface between SIP and the PSTN. For most SIP-based service providers this means it’s something their carrier does. As long as you have configured your system to pass along T.38 messages between your carrier and your customer, commonly referred to as T.38 pass-through, your customer’s T.38 device ends up talking T.38 to your carrier’s media gateways, and it ‘just works’. Unfortunately, there’s not a single carrier, not even Level3, who does T.38 well. Even worse, the quality of the T.38 can vary wildly depending on what route used to switch any given call. That’s where we come in. Our T.38 is consistently awesome. We don’t use our carrier’s T.38 — instead we collocate our equipment inside their network and do G.711 audio directly onto the PSTN over a single optical hop. Your customers’ equipment will only ever interact with our T.38 media gateways, ensuring predictable, high quality and worry free faxing. Our T.38 implementation is exceptional, and because it’s our own in-house technology we’re constantly improving it. We really know what we’re talking about. Ask most people how to get T.38 working and they’ll simply parrot back what google has told them – namely to slow the speed down to 9600 bps and turn off ECM error correction. This misinformation is so widespread that most carriers intentionally disable ECM support in their T.38 gateways. We think that’s crazy – the whole point of a facsimile is to have an exact copy of the image on the other side and that doesn’t happen without ECM, and if you slow the speed to 9600 you’re eliminating faster speeds and modulation speed that help cope with challenging audio conditions. We have a great deal of experience with Cisco, asterisk and asterisk-based platforms such as FreePBX, freeswitch, and a whole host of other common SIP switching gear. Finally, we’re fax industry veterans and if your customers do report any issues, our fax support ninjas will have your back. Imagine being able to escalate a fax problem to your upstream carrier and have them actually diagnose and fix it!!? ?